To all the girls out there, who have bigger problems than ‘I don't have anything to wear', we're sailing in the same boat. Our hair problems are, and the rage we go through ends us up in a lousy mood altogether. The struggle is real girls, and I feel you totally, how hectic it gets to manage your hair daily. But what if I told you there's life beyond just shampooing your hair and a savior that stays put on bad hair days? Yes, we have found a solution that has come in a tool. Babyliss Pro Nano Titanium spring curling iron is here to your rescue, the one that lets your hair look fresh! Curl your hair without any fret with this Nano Pro curling iron. It guarantees to make your life easier. I love how the barrel looks, and it's effortless to use on hair. More than that, the grip is quite firm which makes it easier to curl your hair. The best part is it heats up quickly. Pay attention to the barrel as the other side is a bit small which could burn you. So be cautious and use it wisely. The barrels of this are quite flexible. They come with a snap and lock. The barrels being so easy to use can help in curling, as well as perming your hair. It gives a perfect bounce you need. Heating the iron rod to 430 degrees is enough to get the right type of curls for your hair. This curling iron by Babyliss Pro stands out because of its excellent design. It's vital to use this to get different types of curl. 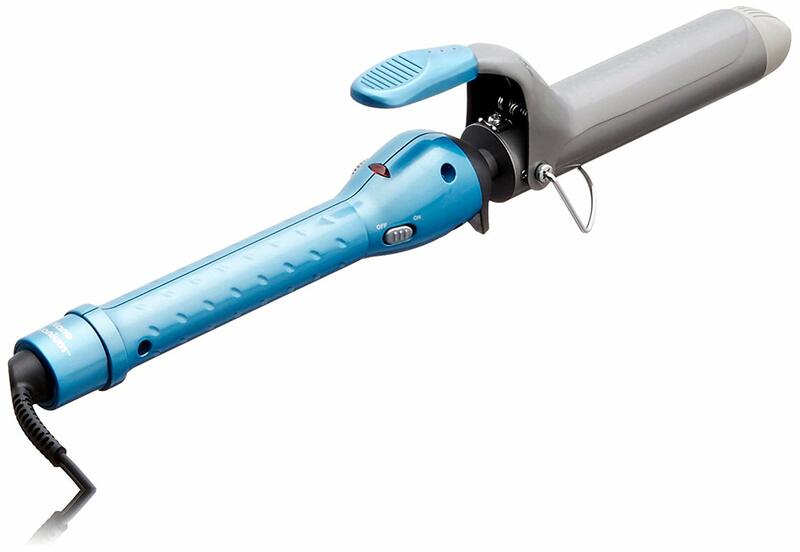 The A-1 spring barrel guarantees tight curls, and then there is a bubble wand that is useful for thin and silky hair. For all the ones who find straight hair a tad bit boring, can use the Nano Pro curling tool to add versatility to the hair. There is also a hot brush attached to it that can act as resistance comb for your hair. The packaging also comes with gloves that will protect you and your hair from any damage. Initially, when I used it, I had my doubts about it because of so many techniques available in it. With a guide inside of it, it was easier for me to try it. On days when I feel too tired, I opt for loose curls, and when I have to head out, tights curls are the way to go for me. We are accustomed to the digital number on the barrel, but this one notifies the power of the heat with the light on it. It's not just me who thinks that, but a lot of other reviews in the past have stated about BaByliss is their escape from hair problems. Everyone who believes that hair styling products can ruin your texture should be fearless because this babylisspro nano titanium product keeps your hair sane. Just use a dab of hairspray post your curl sesh, and you will be good to go. This babylisspro nano titanium has extra facilities for all the pros in the salons. For perfect and smoother curls, this machine is quite vital. It controls the temperature and lets one have firm, soft swirls. The sol-gel technology and the turbo heat button of this one make it better than the standard iron rods. Be it your wedding day or your friend's, this curling iron grants perfect results. Available in 40$, this one is totally worth every penny! I can vouch for this, and you must go for it, in case you are second guessing investing so much in one product. The last word from my end about the babylisspro nano titanium Curling Iron tool is you must get it before your hair starts losing it out on you more. I am aware that change is constant in your life and if it comes with hair styling tools, why miss out? Go for it and lean on it!